Aston Villa booked a date with Arsenal in the FA Cup final—and crushed Liverpool's hopes in the process—as Fabian Delph guided the Clarets to their first final in 15 years topping a remarkable performance by Tim Sherwood's side. Despite a poor start, it was Liverpool who seized the initiative as the Reds bombarded the box and found their reward through a finish from Philippe Coutinho. However, they would only savour their lead for 6 minutes, with the midlands-based side Aston Villa striking back through a quality team goal capped off by Christian Benteke. Euphoric celebrations would follow in the second half, when captain Fabian Delph touched the ball between two centre-halves before unleashing on the turn for the wining goal. With 85,416 fans watching on in the English capital, Liverpool came close to making the first dent through Joe Allen, but the Welshman fired his shot well over goal. It was then Villa's cue to take some real control in the contest, with Charles N'Zongbia forcing an intricate save from Simon Mignolet as he surged forward to sting the hands of the Belgian keeper. Moving the ball around far better and pressing with much more intent, the flow of the Clarets' play would be disrupted when Nathan Baker was forced off with an injury, coming off for Jores Okore. Rodgers' men grasped the advantage with both hands minutes later, when constant pressure lead to an error from Okore, and another from Delph, before Coutinho burst through the defence and saw his curled shot deflect past a helpless Shay Given in between the sticks. Aston Villa didn't want to trail for too long, and set out reflecting those intents, with Fabian Delph and Jack Grealish linking up well before finding Christian Benteke for a side-footed effort into the bottom corner. It was a contrasting first-half, with only a few minutes of it controlled by the Reds. Looking for change, Lazar Markovic was substituted off for Mario Balotelli. The Italian didn't find much luck early, and neither did the whole Liverpool side, with a relentless pace and unrivalled work ethic opening several opportunities. Fabian Delph finally made use of one of those when Grealish found Delph charing in, cutting inside Lovren and firing the ball past Mignolet to the far post. Things could have gotten worse for Liverpool within minutes, as Richardson's curling effort brought an end to a promising spell of play. Chances ran thin for Liverpool, meanwhile, with Joe Allen's attempt courageously blocked by Ashley Westwood and plenty of numbers available to charge the ball down and regain possession. A world-class challenge from Alberto Moreno thwarted Delph from getting another when Villa charged on the break, but panic was setting in as Liverpool's hopes were fading away. Steven Gerrard had a couple of free kicks blocked, but his biggest opportunity was a header cleared off the line by Richardson before Balotelli was on the other side, for once, of some controversy, wrongly adjudged offside when he was through on goal. At the sound of the final whistle, desolation dominated the facial expressions of Liverpool players, fans and staff alike, while it was a polar opposite for Aston Villa as they were one step away from FA Cup glory. 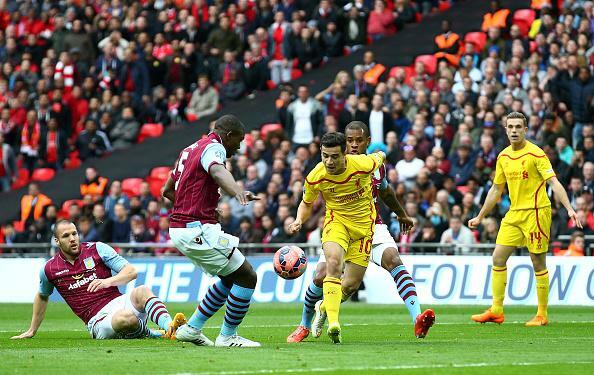 Fabian Delph strikes for Aston Villa as they overcome Liverpool to reach the FA Cup final.